Barrick Gold was expected to raise its estimate of the cost of completing the project. Instead, it decided to halt construction. Image courtesy of Greenpeace. Canadian Barrick Gold Corp. (TSX, NYSE:ABX) said Thursday it is temporarily suspending all construction activity at its controversial $8.5 billion Pascua-Lama project straddling the Chile-Argentina border. Delivering its Q3 results, the debt-laden gold miner said the decision allows the firm to protect capital and cut its spending guidance for 2014 by $1 billion. But the move also casts a doubt on the future of the project, a critical one for Barrick, as it holds gold reserves of nearly 18 million ounces. "We have determined that the prudent course —at this stage— is to suspend the project, but naturally we will maintain our option to resume construction and finish the project when improvements to its current challenges have been attained," chief executive Jamie Sokalsky said in a statement. 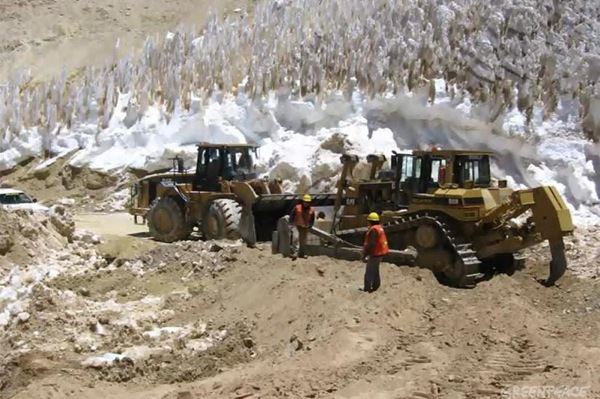 “We see Barrick’s decision to suspend operations until they have full access to the Pascua- Lama site as a fiscally prudent approach, which under the current circumstances, should enhance the project’s capital efficiency and improve the project’s economics going forward,” said Randy Smallwood, Silver Wheaton’s (TSX, NYSE:SLW) President and Chief Executive Officer. The Vancouver-based fellow Canadian firm said it has amended its silver purchase agreement with Barrick and now it is "entitled to silver production from three of Barrick’s currently producing mines, Lagunas Norte, Pierina, and Veladero mines to the extent of any production shortfall at Pascua-Lama," until the end of 2016. Since the world's No. 1 gold miner began building Pascua Lama, it has faced one roadblock after another, the latest being a threat of a strike from its Chilean workers. “Significant cost and operational improvements achieved this year, including previously announced reductions of $2 billion from budgeted 2013 capital and costs, have translated into another quarter of strong results,” Sokalsky said.